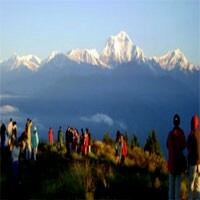 Nagarkot Changunarayan day hike itinerary starts very early from Kathmandu to see the unblock sunrise from Nagarkot with the stunning view of the Himalayas. After driving about 2 hours in the early morning you reach to the Nagarkot hill station from where you see stunning big white mountain ranges, unblock sunrise, valleys, terraces, and more. 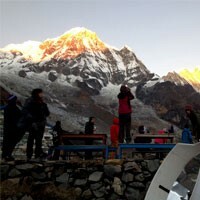 Enjoying the views, have breakfast and start a hike to Changunarayan through the typical villages, temple and hills. This Changunarayan day hike itinerary has two parts which descends the first part and ascends for half an hour and walk on the flat part in the second part. After walking for about 5 hours, you arrive in Changunarayan temple which one of the world heritage site in Nepal. Visit the temple and drive back to Kathmandu. Day 01 : Drive to Nagarkot (2175m.) 2 hrs. 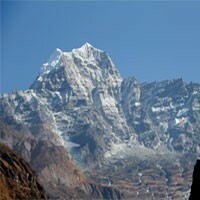 and Hike to Changunarayan 5 hrs. We drive very early morning from our hotel to Nagarkot for the beautiful sunrise, scenic mountain view, valley, terraces, and much more and have our breakfast at Nagarkot. After our breakfast, we hike down to Telkot through the Tamang village where we see their lifestyle and the activities than we ascend for a while to the Telkot hill and hike on the ridge by viewing the great Himalaya and Kathmandu valley. Walking on the flat trail, we reach Changunarayan temple which is a world heritage site of UNESCO than drive back to the hotel. Overnight at the hotel.